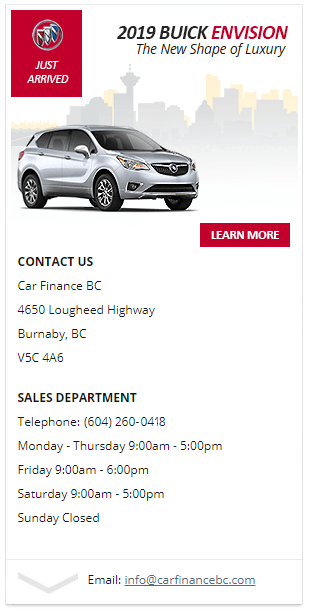 Car Finance BC | Questions? Great! Contact Us NOW! Get Your Vehicle Loan Approved Today! Drive Away Tomorrow! At Car Finance BC – we’ve assisted thousands of Canadians obtain personal vehicle loans while exceeding our loyal customers expectations. Today, we remain committed to providing an unrivaled vehicle purchasing experience that – removes any pressure and provides our customers with the unparalleled level of service, superior vehicle selection and the affordability they desire! Our trained credit specialists work alongside numerous financial institutions to provide you with the most favourable terms and repayment options – best suited to your circumstances! Learn more about our Fast Approvals and 99% Acceptance Rates (no matter your current credit status!) or complete our quick and easy credit application today!